A cycle tracker. There are a lot of good ones out there, including Fertility Friend, Kindara, and Woman Log. My personal favorite is Woman Log, although I believe it is only available on Android. Whichever one you choose, you need one that tracks all things related to your cycle…ovulation, symptoms, BBT, cervical fluid, luteal phase, etc. My Fertile Food. Available on iTunes. This app has daily targets to help you achieve optimal diet when TTC. It tracks healthy fats, protein, veggies, fruits, whole grains, and super foods. My Mobile Fertility. Available on iTunes. This app is for holistic fertility treatment and endeavors, such as acupuncture and advocacy groups. Momento (iTunes) or Journey (Android). These are journal apps where you can record things from each day. Studies show that the more you focus on the positive, the more improved your mood and overall outlook on life. You can add pictures to entries or just do text. Bible app. Take some time out of your day to read some Scripture. Positive Inspirational Quotes or Life Inspirational Quotes. Encouraging and motivating memes for every day. 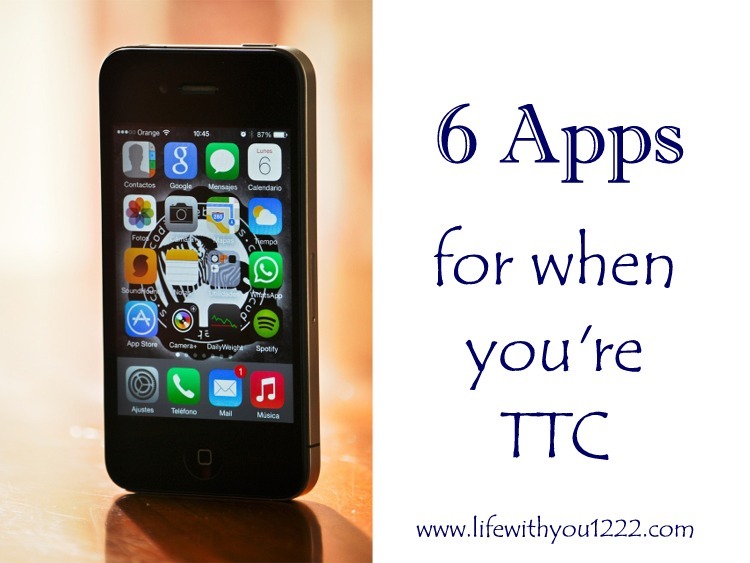 What apps do you recommend for those TTC?